AT EVERY BIG Filipino occasion, there is a toast. Next month, Hawaii's Filipinos will begin a year-long celebration of 100 years of immigration. The first 15 sakadas, contract sugar plantation workers from the Philippines, arrived here on Dec. 20, 1906, beginning an ongoing cycle of immigration. 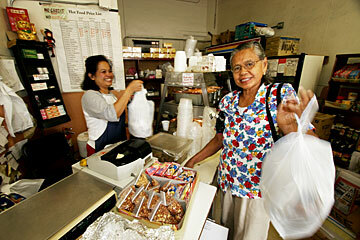 Today, Filipinos are the fastest-growing ethnic group in Hawaii. More than 275,000 isle residents identify themselves as Filipino or part Filipino, 23 percent of the state's population. Over the next few days, the Star-Bulletin and KITV-4 News will share some of the stories of immigrants who came to Hawaii in search of a better life. We begin with a look at a community generations of immigrants have called home -- Kalihi. The story of Hawaii's Filipinos -- of sacrifice and success, of families separated and reunited, of hard work and the American dream -- is Hawaii's story. Their centennial is a reason for everyone to celebrate. We'll kick off our celebration with a look back at the story of the sakadas, the first wave of Filipinos to come to the islands. We'll also look at the generations of descendants who made an impact on Hawaii. 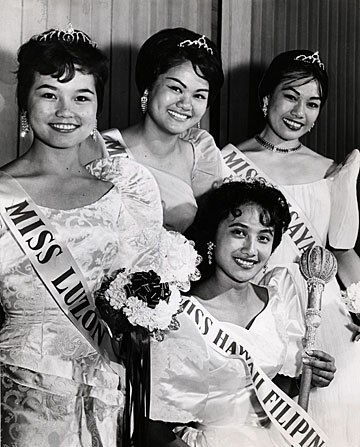 Hawaii-Filipina Pageant winners from 1961. 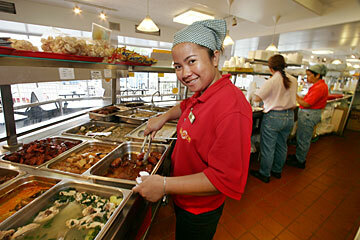 Gloria Taclan, who is making cutsinta at the Golden Coin Restaurant. Tomorrow through Wednesday: Paula Akana's series continues on the 10 o'clock news. And on KITV Island Television News at 5, Pamela Young and Gary Sprinkle take you on a trip to the Philippines. A day in Kalihi - Francisca Maruquin and Linda Pascua are cooking pork that will be made into chicharon, which is deep fried pork skin and meat, at San Nicolas Liquor & Grocery. EVEN BEFORE KALIHI shows signs of stirring, Gloria Taclan has been up for several hours, pulling tray after tray of "pandesal" from the oven, the fresh-baked aroma welcoming customers into Golden Coin Restaurant. The restaurant in this aging neighborhood sandwiched between Kalihi and Umi streets is part of a community of mom-and-pop businesses and services that mostly cater to Filipinos. For them, Kalihi is where they feel most at home. Mary Academia, 68, an agriculturist/ home economics teacher who came here in 1974, catches the Express bus early from Ewa Beach to Golden Coin so she can have a small breakfast of coffee and pandesal before heading to work as a cake decorator. "We grew up with pandesal -- that is our morning bread," said Academia as she pulled apart the soft roll still warm from the bag and popped a piece in her mouth, chewing contentedly. Golden Coin, with its familiar gold-and-red facade, bakes up nearly 540 dozen pandesal a day. And they're still $2.50 a dozen -- the same price since they began selling the Filipino rolls from the family-owned manapua business just down the road, said Margaret Lim, daughter of the owner, family matriarch Gloria Uy. The family is Chinese but lived in the Philippines. 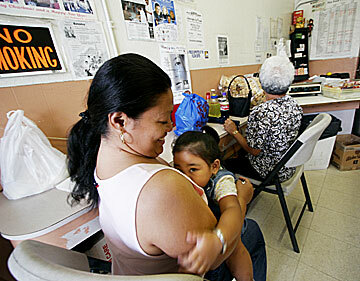 The Filipino population in Hawaii is concentrated on Oahu, where 69 percent of those who are full or part Filipino live. On Oahu, Kalihi, Waipahu, Ewa Beach and Wahiawa have the highest concentration of Filipinos. 275,728: People who identify themselves as Filipino or part Filipino in Hawaii. They make up 23 percent of the state's population. 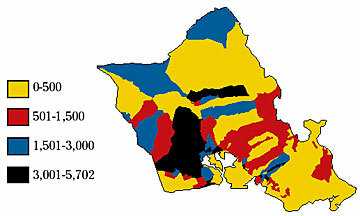 63: Filipinos as a percentage of the total population on Lanai. Kauai has the second-largest share at 32 percent. 170,635: People who identified themselves as full Filipino, about 15 percent of the state's population. 3,500: Approximate number of new immigrants to Hawaii from the Philippines each year, more than any other country. Their specialty initially was frozen, microwavable manapua, but their immigrant customers would request Filipino delicacies such as "puto" (rice cakes) or "cochinta" (another rice dessert) -- even sharing their recipes so they could be duplicated, Lim said. Just down the street, at Fiesta Mart, Royal Tru-orange -- a popular orange soda in the Philippines -- shares space in the refrigerator alongside Pepsi. "They miss a lot of stuff in the Philippines," said Jonathan Lim, a Philippine-born Chinese whose father owns the shop, which caters to Filipino immigrants. 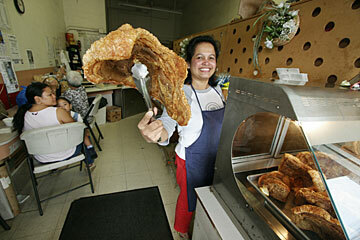 Mercy Leano shows a sampling of chicharon at the North Store Variety Store. The latest copy of Bannawag, the popular Ilocano movie star magazine, can be found here, as well as various brands of skin whitening soaps and laundry bars scented with kalamansi. The older Filipinos grew up with the scented laundry bars and like their clothing to smell just like it did back home, Lim said. LARGE COOKING WOKS called "kawali," "ting ting" (brooms made from the bone of the coconut leaf) and "bagoong" (fermented fish sauce used in Filipino dishes such as pinakbet) are available. A few doors down, Radcliff Quiton looked a tad embarrassed as he walked into Northstar Variety Store clutching a brown manila envelope bulging with documents. The 29-year-old construction worker from Waipahu was seeking Maggie Domingo's help to bring his fiancee to Hawaii. He and Marivon Bautista, 22, of Santo Domingo, Ilocos Sur, hope to get married by Christmas, he said shyly. Domingo, a travel and insurance agent/radio producer/announcer/notary whose office is a tiny cubicle in Northstar, helps people file petitions for spouses and other family members of U.S. citizens to come here. Quiton's father heard about Domingo's services on her daily radio show -- the "Saniata Variety Hour" on KNDI radio -- and urged him to see her. A cousin had introduced Quiton to Bautista, and after six months of corresponding by mail, followed by phone calls, he proposed to her in a letter. 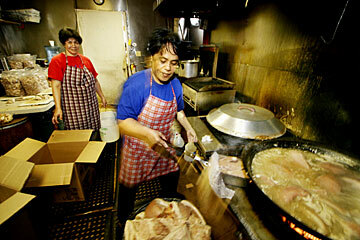 Consolacion Guerrero buys Filipino food items such as chicharon from Mercy Leano at Northstar Sausage. Guerrero said she sends Filipino foods to her four grown children in New York, where they say such items are not easily found. The food is sent next day delivery. At the warming oven out front, Consolacion Guerrero, 74, brandished a pair of tongs and a paper bag as she selected golden slabs of "chicharon" -- deep-fried pork belly -- sold by the pound. Guerrero, who lives nearby, comes to Northstar at least two or three times a month to purchase chicharon to send to her four adult children, a doctor and three nurses who all live and work in New York, she says in her native Ilocano. She freezes the chicharon and sends it via express mail to arrive the next day. Guerrero still lives in the house her late husband purchased in 1971. They converted it into eight separate units, renting the remaining rooms to help pay off the mortgage. With her children no longer at home, she says she feels at home in Kalihi with her Filipino neighbors, and bus service is convenient. KALIHI is considered a "gold mine," the most sought-after neighborhood for Filipino home buyers, said Roland Casamina, president and CEO of House of Finance. Waipahu and Ewa Beach are next on their list of choices, he said. Casamina, who grew up in Kalihi and now runs his business just blocks from his boyhood home, said Kalihi is close to the main bus routes -- the lifeline for many Filipinos who rely on public transportation to get to and from two, sometimes three jobs. Those looking to buy in Kalihi are looking for large, multiroom homes where they can live and rent out the rest of the units to tenants so they can make mortgage payments, Casamina said. Some turn their houses into care homes. 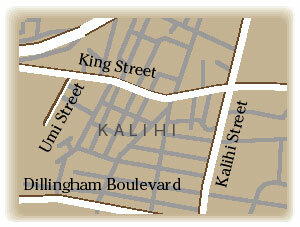 Many of its residents feel safer in Kalihi than if they were living in a less familiar neighborhood, like Kailua. "Kalihi people here know each other," Casamina said. 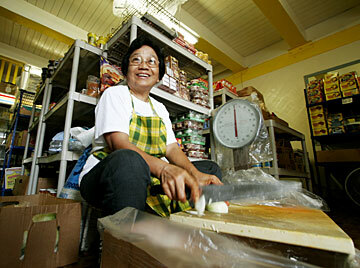 Fely Butay chops onions at San Nicolas Liquor & Grocery. AT SAN NICOLAS Chicharon & Sausage, the heat from the kitchen and the strong aroma of adobo and other Filipino dishes assail customers stopping by during the afternoon rush hour. Nancy Ramirez was straining to catch her husband's order on her cell phone as customers queued up behind her. "Is that all you want? 'Dinardaraan'? That's all I'm going to get, then." Ramirez said she sometimes stops by the Filipino takeout restaurant for her husband's dinner before heading home. Today, he just wanted with dinardaraan, a pork dish cooked in pig's blood, with two scoops of rice. Reynie Butay, 54, one of several co-owners of the family-owned takeout and adjacent grocery store, puts in 13-hour days several days a week doing everything from payroll to purchasing to dishing food into Styrofoam containers behind the counter. 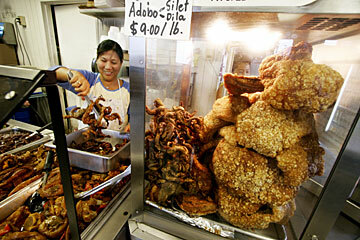 Linda Pascua places pig intestine in a glass case next to the chicharon at San Nicolas Liquor & Grocery. The store is named after the family's hometown in Ilocos Norte. Her husband, a waiter at the Hyatt Regency, petitioned to bring her here, and she arrived in 1979 "to better my life" and because opportunities were scarce back home, she said. Running a business is hard work, but "this is the way we earn our living," said the mother of three grown children. She once thought of opening up a care home -- she was once a certified nurse's assistant -- but even that is hard work, she said. Besides working at the family business, Butay has a part-time job in Waikiki at the Resort Quest, where she has held positions from maid to executive housekeeper. After signing for the delivery of pork from her local supplier, Butay directs a customer inquiring about "balikbayan" boxes to the rear of the grocery. Wanda Tsukiyama needs the box -- its specific dimensions accepted by airline and cargo shipping standards -- to pack macadamia nut candies and other customary gifts to bring to family in the Philippines. Comparable to the Japanese custom of omiyage, Filipinos bring balikbayan boxes stuffed with gifts for family and friends when they return home to visit, Butay said. Balikbayan refers to someone who returns home after working or living abroad. 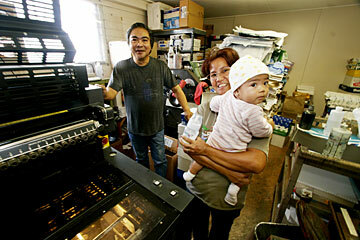 Sam Domingo and his wife, Frances Domingo, are owners of S&F Printing. Francis holds their 8-month-old granddaughter, Isabel Lemus, who they are baby sitting. IT'S 11 DAYS before the Santo Domingo, Ilocos Sur Organization of Hawaii holds its annual banquet, and the souvenir programs are not ready yet. But when treasurers Letitia and Herman Tesoro drop by S&F Printing to submit their last-minute work order, owner Sam Domingo is happy to accommodate them, even though he has two other souvenir programs due the same week. Filipinos are into pageantry, he said, holding up a recent program he printed for the Filipino Women's Civic Club's 54th anniversary and 34th annual Maria Clara Ball. Its cover is graced with a colorful spread of Filipino women dressed in their finest Maria Clara -- a symbol of Filipino womanhood. Domingo, a medical technologist for 22 years, started the printing business in 1997 out of his Ahuula Street home and moved into the cramped 900-plus-square-foot space next to San Nicolas Grocery in 2000. His wife, Frances, the other half of S&F, quit her job as a real estate and insurance agent when business began picking up. ACROSS THE STREET, Patricio Ampon, a hotel maintenance worker who lives in Liliha, clutched a receipt as he exited MB Remittance. He had just wired $628 -- the equivalent of about 33,738 pesos -- to the Miller Sanitorium and Hospital in the Philippines to help pay for treatment of his wife's niece. He usually sends about a $100 a week, but a larger payment was required this time. "We try to help," he said, noting his wife's niece needs all the help she can get. Ramon Nicdao, operations manager at MB Remittance Centre, a correspondent of Metrobank, the largest bank in the Philippines, said business has been growing steadily since the Kalihi branch opened five years ago. Remittances are a way for families here to send money back to loved ones in the Philippines, he said. Nicdao worked at Metrobank in Taiwan, where Vietnamese customers were big on remittances. But the custom of sending money back home was nowhere as big as it is with Filipinos, he said. AT THE Susannah Wesley Community Center, the "Young Once" dancers led by Mercedes Palijo continue the legacy passed on by her sister, who died last year. It was her sister who urged Palijo, now 68, to come to Hawaii -- "You have better chance in America" -- and begged her to continue teaching the dances to keep their culture alive. The dancers practice weekly and entertain at parties for free for anyone who invites them, Palijo said. Monico Mariano gets his hair cut by Wilfredo Calaro at Joe's Barber & Hair Style. AFTER 40 YEARS of living in Kalihi, Laura DeFiesta sees no reason to leave -- not with everything she needs and wants close by. She appreciates being surrounded by Filipino neighbors. "I feel at home -- like they welcome me," she said. At one time she had Caucasian and Japanese neighbors and also got along fine, she said. The former obstetrical technician and midwife raised four sons in a two-story, four-bedroom home, just a short walk to the nearest bus stop, market or specialty store, bank and Filipino or Chinese restaurants. She was able to petition her siblings and parents to come to Hawaii and provided a place for them to live. Shy 3-year-old Juslene Vinoya hides behind her mother, Madeline Vinoyain, at the North Store Variety Store. DeFiesta brushes aside comments from people who think of Kalihi as a den for gangs and drug dealers. Over the years, they have had a neighbor arrested for importing "ice" in margarine containers, her husband's Chevy hot rod with $500 worth of coins stored inside was stolen from their driveway and police have come knocking at their door looking for a relative. Despite those incidents, their lives in Kalihi have been blessed, she says. On afternoons that her semiretired husband, Enrique, a former missile technician with the Army National Guard, comes home early from his part-time custodian job, they relax in their carport and tune in to their favorite radio show, "Linabag ti Napalabas" ("memories of yesterday"), listening to Filipinos call in with happy or sad stories of coming to Hawaii and living here. "I really thank God that I came here," said DeFiesta. "The people are nice, life is high standard -- it's very good." Dec. 20, 1906: The first group of 15 sakadas (contract laborers) recruited by the Hawaiian Sugar Planters Association to work on the sugar plantations arrive in Honolulu aboard the SS Doric and were assigned to the Olaa plantation on the Big Island. Filipinos have risen to the top elected offices in state and local governments in Hawaii. Below is a list of some notable Filipino elected officials. Eduardo Malapit: The Kauai mayor in the first mayor of a U.S. county of Filipino ancestry. Rudy Pacarro: First Filipino-American who was selected as chairman of a City Council in U.S.
1915: The Philippine Government (under U.S. colonial rule) expresses concern about labor outflow and recruitment abuses. HSPA works out a system of individual contracts. 1919: Filipino labor leader Pablo Manlapit organizes the Filipino Labor Union to demand higher wages and better working conditions for sakadas. 1920: Manlapit and Japanese labor leaders form the Higher Wages Movement but HSPA rejects the demands. Filipino and Japanese workers strike separately and about 12,100 workers are evicted. 1924: Manlapit calls a strike on Oahu and the other islands, ending violently. Sixteen Filipino workers and four policemen are killed on Sept. 9 in the Hanapepe Massacre on Kauai.1932: Pablo Manlapit returns to Hawaii and revitalizes the Filipino Labor Federation with Antonio Fagel and Epifanio Taok. Labor organizing focuses on Maui. The union is renamed Vibora Luviminda. Manlapit is deported permanently from Hawaii. 1934: The Tydings-McDuffie (Philippine Independence) Act declares Filipinos aliens and limits their entry to Hawaii and U.S. to an annual quota of 50 persons. It is increased to 100 after Philippine Independence in 1946.1941: The United States enters World War II . Filipino-Americans form the 1st and 2nd Filipino Regiments of the U.S. Army. 1944: The International Longshoremen's and Warehousemen's Union under Jack Hall's leadership becomes a strong political force by organizing ethnic workers, including Filipinos. 1946: ILWU calls strike that paralyzes the island economy. HSPA imports the last group of 6,000 Ilokano sakadas. 1947: Philippine Consulate is established in Honolulu. 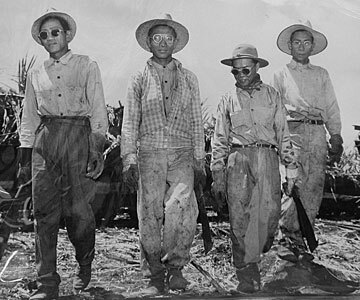 1951: Filipino workers on Lanai led by ILWU business agent Pedro de la Cruz call a strike lasting 201 days. Major work benefits are won. 1954: Attorney Peter Aduja becomes the first Filipino to be elected a representative in the Hawaii Territorial Legislature. 1959: Hawaii becomes the 50th state. 1962: Alfred Laureta is appointed director of the state Department of Labor and Industrial Relations, the first Filipino-American to hold a state Cabinet position in Hawaii. Laureta was later appointed as the first Filipino to become U.S. district judge in Saipan. Benjamin Menor is elected to the state Senate, the first Filipino immigrant to be elected to a seat in the Senate. 1965: Immigration Law is liberalized allowing family reunification and professionals to enter Hawaii. It results in the third wave of Filipino immigrants to Hawaii increasing the number of Filipinos to nearly 11 percent of the total state population.1972: Philippine President Ferdinand Marcos declared martial law in the Philippines, which lasted 14 years and divided the Hawaii Filipino community. 1974: Benjamin Menor is appointed justice of Hawaii Supreme Court, the first Filipino to hold that position in any state Supreme Court. 1975: Eduardo Malapit is elected mayor of Kauai, the first Filipino-American to be elected mayor of a U.S. county.1986: The Marcos dictatorship topples. He arrives to Hawaii in exile. In the same year, Sister Grace Dorothy Lim, originally from Ilocos Sur, Philippines, is named the first female chancellor of the Catholic Diocese of Honolulu. 1987: Daniel Kihano is elected House Speaker of the state Legislature, the first Filipino-American to occupy the position.1990: Lorraine Rodero-Inouye, daughter of an Ilokano immigrant from Ilocos Norte, becomes mayor of the Big Island, the first woman of Filipino ancestry to be elected mayor of a U.S. county. 1994: Benjamin J. Cayetano, son of an immigrant from Urdaneta, Pangasinan, is elected as governor, the first Filipino-American to occupy the highest state office.2001: Robert Bunda is elected Senate president in the state Legislature, the first Filipino-American to fill the position. Angela Perez Baraquio, daughter of an immigrant couple from Pangasinan, becomes first Asian-American to win the Miss America title. 2002: The Filipino Centennial Celebration Commission is created to plan the observance of the 100th anniversary of the first Filipino arrivals in Hawaii. The Filipino Community Center in Waipahu is completed after several years of fundraising. 2005-2006: Year-long observance of the Filipino Centennial starts on Dec. 10. Source: Belinda Aquino, director of the Center for Philippine Studies at the University of Hawaii at Manoa.